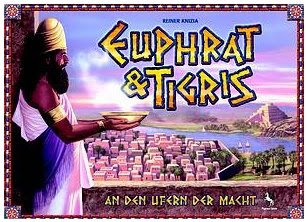 The game was initially published in 1997 and already has become a classic - it is a territory building game settled in ancient Mesopotamia and has been designed by Reiner Knizia. Each player leads one of the four dynasties and tries to build up mighty kingdoms. 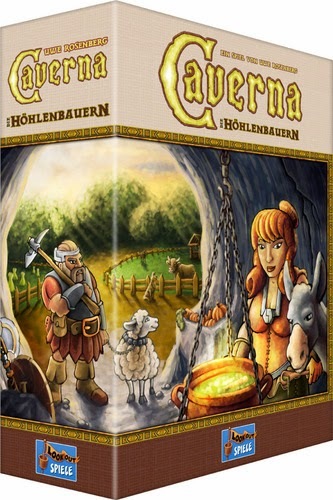 I played the game published by Pegasus Spiele, and I have to say that the quality of the whole material is very good. Not only the layout and graphics have been adopted and fit to the topic of the game pretty well, also the board itself and the tiles are of high quality and will surely endure a lot of games without suffering. The rules are simple at first sight, but are offering a lot of rather complex activities - I had to read through them twice to be ready for the first game, although most of the actions are logical and quite clear after the first sessions. 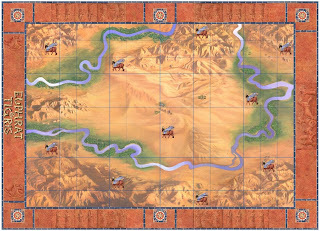 Each player chooses a dynasty and controls four leaders of this dynasty (a king, a farmer, a priest and a merchant) trying to place his civilization tiles in that way that he gains control over huge kingdoms and earns the most victory points out of each territory. What makes the game especially interesting is the unusual victory condition, which says that the player with the most victory points for his WEAKEST faction wins the game. A little confusion after reading the rules has changed into the desire to find out more about the complex strategies which are offered by this great game. The interlocking mechanisms and different strategies guarantee a lot of thinking and lasting fun with this well-balanced game, which is ranked 2nd on boardgamegeek - quite rightly from my point of view. Thousands of years ago, in the fertile land between the Tigris and the Euphrates rivers, a new civilization flourished. The leaders of the powerful and independent kingdoms were believed to be the earthly representatives of the gods. These leaders developed this new culture, which would last for thousands of years. Many of the most important scientific and cultural inventions would develop under the rule of these leaders. Farmers would discover the wheel and use it for the oxcarts needed to bring produce to market. The characters of cuneiform, the earliest form of writing, were invented long before the Egyptians developed their own hieroglyphics. Take care! It is your responsibility to see that your dynasty grows and prospers in this land. You must use your four leaders: the King, the Priest, the Merchant, and the Farmer, to accomplish your goal of forging strong kingdoms out of the fledgling settlements that dot the landscape. The key to your victory, however, does not rest in military conquest alone! You must develop all four areas of civilization: Politics, Religion, Trade, and Agriculture.